Francis Adirubasamy: A mouthful of water will not harm you, but panic will. LIFE OF PI is an almost entirely unbelievable story that provides a great deal of solace and inspiration for so many who have been fortunate enough to read it. Its scope is so vastly epic, essentially biblical in nature. For years, Yann Martel’s 2001 Booker Prize winner had been called unfilmable. 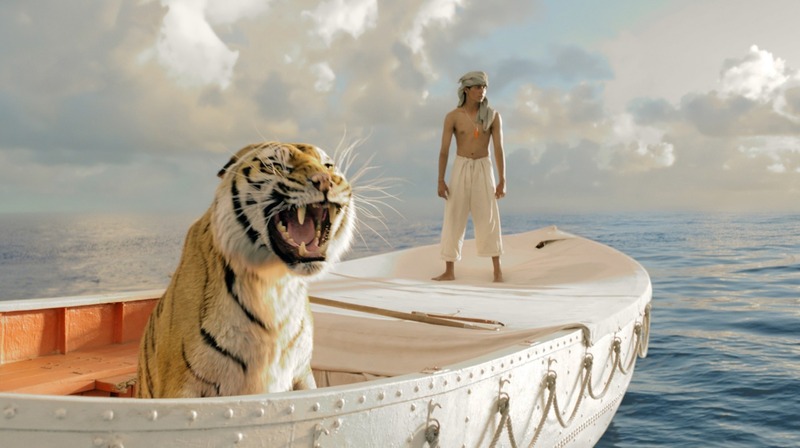 Directors, from M. Night Shaymalan to Alfonso Cuaron, came and went without finding a successful way to translate the incredible story of a boy trapped at sea with a bengal tiger to the screen. Enter Academy Award winning director, Ang Lee, the man with the sensitivity and vision necessary to make LIFE OF PI into the inconceivable spectacle it needs to be in order to meet its goal - proving the existence of God. 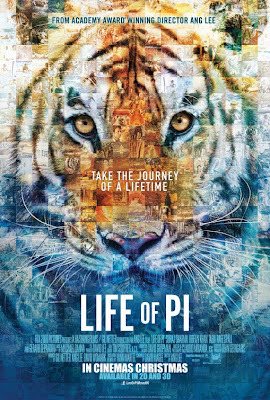 From the moment Lee sets the scene, the Pondicherry Zoo, in India, where Piscine “Pi” Patel (newcomer, Suraj Sharma, chosen by Lee from over 3,000 auditions) grew up with his family, the language of the film is light and lyrical. The animals in this zoo move with grace and a sense of purpose and Lee follows suit as though he is truly letting the nature of this wondrous tale unfold in front of us. The story is being told by a present day Pi, played by Irfan Kahn, who plays this elder incarnation like a man enlightened by all that life has shown him. Khan is telling his story to an author (Rafe Spall, in a role that was originally Tobey Maguire’s), presumably based on Martel. His narration, which is heavy at first but eventually gives way for the action itself, lends a much needed resonance to the sometimes implausible chain of events. Pi’s family decides one day to pack up everything they own, including the great wealth of animals in their collection, and move from Pondicherry to Winnipeg. The promise of a better life is put to the ultimate test for Pi, when the freighter inexplicably sinks in the midst of a storm just a few days after leaving port. Pi is the only survivor, well, human survivor anyway, which is not at all surprising when you see how immense his escape from the sinking ship is. This is the other reason I’m happy they waited so long to make this movie. 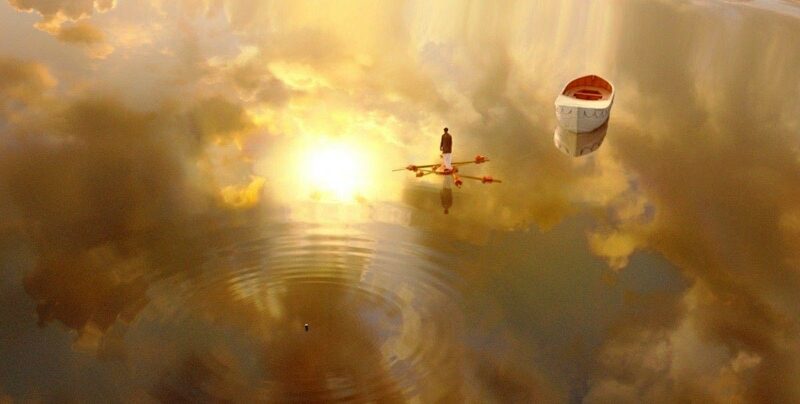 Lee’s usage of 3D is exemplary in LIFE OF PI. 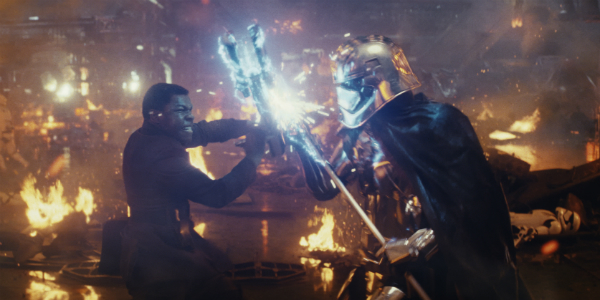 Not only does it make for a dazzling visual feast, but it highlights the distance the character feels from his lost family, from land, from God. While some directors would get lost at sea for this long in a movie, Lee comes alive. His ocean, one that could be very static if not tended carefully, is a constantly changing symphony of movements that are both terrifying and mesmerizing. And to move back and forth between the never ending ocean and the confined space of the rescue boat so seamlessly, is a true testament to what mastery Lee commands and his deep understanding of the audience. A story that is supposed to make you believe in God has to be immense to accomplish such a lofty goal. What Pi endures on that boat with his feline shipmate, Richard Parker, should not be believed, but yet to read it on the page, is to behold an extraordinary tale of strength and spirit. The fact that Lee has so triumphantly captured both the bewilderment and inquisitive insight of the book is in itself enough to make me a believer. Only God could craft something so moving through the hands of one of His children.